A suspected suicide bomber has carried out an attack near the convoy of the British ambassador to Yemen in the capital, Sanaa. 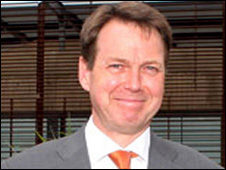 Ambassador Tim Torlot is safe, UK officials confirmed. One person - believed to be the attacker - was killed, say Yemeni security sources. The UK Foreign Office said it had closed the embassy to the public. No group has claimed the attack, but Yemeni and UK officials believe it bears the hallmarks of al-Qaeda. There are mounting fears that Yemen is becoming a leading al-Qaeda haven. Mr Torlot was reported to have been on his way to the embassy when the attack happened in an area of eastern Sanaa said to be popular with militants. British officials are working closely with the Yemeni government to tackle terrorism. British military trainers have been supporting the coastguard and the counter-terrorism unit for several years. Since 2006, the British have also taken a strong lead on development and anti-corruption measures. In January this year, UK PM Gordon Brown took a visible leadership role by convening a meeting in London in response to the attempted Christmas Day attack in Detroit. The British government is leading the Friends of Yemen, an informal contact group created at the London meeting in January. The overall security situation in Yemen has improved in recent months, with a ceasefire agreed between the security services and the Houthi rebels in Saada. Unrest in the south continues to bubble away but Sanaa has been mostly calm recently, until today's attack. Witnesses said the bomber was a young man who was wearing a school uniform, apparently as a disguise, the Associated Press new agency reports. The attacker, believed to be wearing an explosives belt, was said to have thrown himself at the convoy, but was too slow to hit his intended targets. Reuters news agency reports that three other people were wounded - two security officials in a police car escorting the convoy and a bystander. The attack appears to be similar to that carried out against a South Korean diplomatic convoy in Sanaa a year ago. A pedestrian suicide bomber targeted the vehicle on the main road from the city centre to the airport, but killed only himself. "We can confirm that there was an incident in Sanaa this morning," a foreign office spokesman in London said. "There was a small explosion beside the British ambassador's car. He was unhurt. No other embassy staff or British nationals were injured." The spokesman said the embassy would remain closed "for the time being" and urged British nationals in Yemen "to keep a low profile and remain vigilant". Mr Torlot has been the British ambassador to Yemen since July 2007, and was formerly number two at the embassy in Baghdad, so is well accustomed to the threats posed to British interests in the region, the BBC's Christian Fraser the region reports. Security has been stepped up at Western embassies in Yemen in recent months as the US, Britain and other European countries have signalled their intention to play a greater role in combating the extremist groups that threaten Yemen's stability, our correspondent adds. This came in the wake of the Christmas Day attempt to blow up an airline bound for Detroit in the US. The Nigerian suspect, Umar Farouk Abdulmutallab, is said to have been trained by a Yemen-based group calling itself al-Qaeda in the Arabian Peninsula. Western embassies in Yemen are no strangers to attacks. Militants used car bombs and rocket-propelled grenades in a co-ordinated assault on the US embassy last year. The UK and US temporarily closed their embassies in January amid security threats from al-Qaeda. The British embassy was closed twice in 2005 due to threats to "Western interests".